China’s economy is undergoing a structural shift. A massive labor pool, combined with integration into the global trade system, propelled China towards decades of unprecedented economic expansion. Now, China is an increasingly mature economy, and has priorities that go beyond growth at any cost. At the same time, trade frictions with the US and a slowing domestic economy are giving foreign businesses challenges unseen in their years of doing business in China. Faced with heightened geopolitical risks, and rising land and labor costs, many foreign investors are looking to restructure their China-based businesses. Restructuring and relocation plans, however, are being expressed in different ways, depending on the nature and needs of the business. 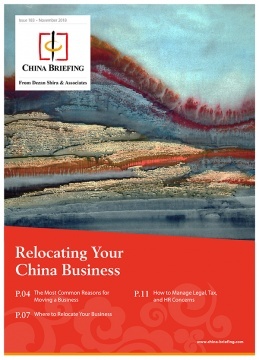 In this issue of China Briefing magazine, we walk foreign investors through the process of relocating their China businesses. First, we look at why businesses might relocate, before identifying where they are ultimately moving to. Then, we guide investors on how to manage the legal, tax, and HR issues that arise during relocation. We hope this magazine serves your business well in achieving its relocation goals.